1. 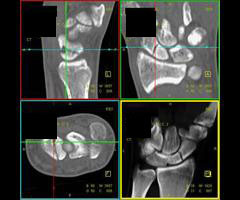 Which of the following is true with respect to multiplanar imaging of the wrist? Correct! Incorrect. 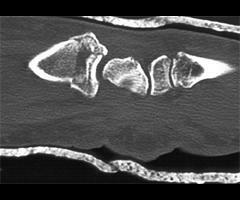 The correct answer is E.
For suspected scaphoid fractures, CT should be acquired in the oblique/sagittal plane. This is optimal for identifying palmar or dorsal displacement or angulation, humpback deformities and fracture diastasis. The axial plane is best for fractures of the distal radius and hamate hook, and to evaluate the DRUJ, intercarpal joints, subluxations and displaced bone fragments. The coronal plane facilitates evaluation of the radiocarpal joint, intercarpal joints and carpal-metacarpal joints, and is the best orientation for post operative imaging following surgical fusion. 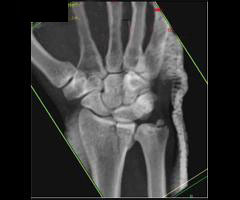 Sagittal imaging has been recommended for identification of intraarticular radial fracture gaps and step-offs and to visualize the axis running along the 3rd metacarpal-capitate-lunate-radius. This plane is also useful for detecting dorsal and palmar subluxation. 2. 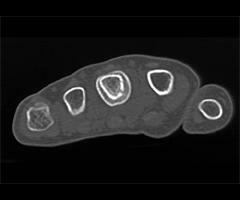 Why is CT imaging essential in determining the outcome of a distal radius fracture? Correct! Incorrect. The correct answer is D.
Intra-articular extension is reported to occur in 50-81% of distal radius fractures. If identified, a detailed description of the location and appearance must be provided. The radiocarpal articulation (at the scaphoid and lunate fossa), the radioulnar articulation (at the sigmoid notch) or the ulnar styloid may be involved. Careful inspection must be made to detect any step-off in the articular region of the radiocarpal joint or gaps, because these have prognostic value for the development of radiocarpal osteoarthritis. The presence of articular incongruities measuring more than 1-2 mm after closed reduction is felt by many to be an indication for surgical reduction to prevent disabling osteoarthritis an d maintain wrist function. CT has been shown to be superior for measuring the articular gapping, with substantially larger measurements compared to radiographs. 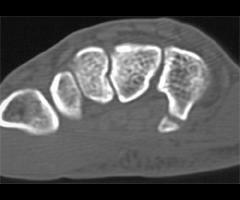 Furthermore, radiographs underestimate the degree of comminution and DRUJ involvement. 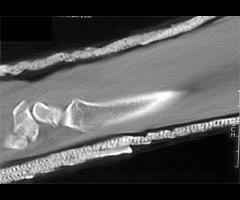 With respect to articular step-offs, one study by Katz showed no significant difference between CT and radiographs for quantification; however, Pruitt demonstrated that determination of the extent of articular surface depression was better with CT.
An ulnar styloid fracture is present in 51-65% of distal radius fractures. Fractures of ulnar styloid are important to identify and localize because of the associated ligamentous injuries. The triangular fibrocartilage complex (TFCC) attaches to the ulnar styloid, and the dorsal and volar radioulnar ligaments attach to the base. The fracture size and the degree of displacement both correlate with the development of DRUJ instability. In one series, all distal radius fractures which developed DRUJ dysfunction had a concomitant ulnar styloid fracture. Fractures of the base had the highest incidence of DRUJ instability. 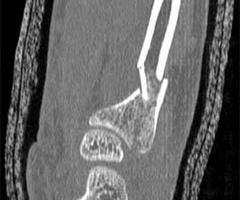 A long list of potential complications have been reported following a distal radius fracture. In addition to delayed union, malunion and nonunion, patients may suffer from loss of motion, nerve compression and pain syndromes like RSD. Complications can arise relating to indwelling hardware, including infection. Additional complications include carpal instability, osteomyelitis, tendon inflammation, dysfunction or rupture, ligament damage, contractures, arthritis, and DRUJ dysfunction. Knowledge of these should guide the evaluation of post operative films in patients with distal radius fractures. 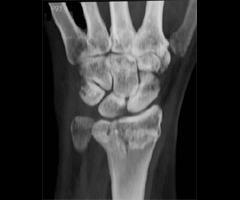 The early detection of scaphoid fractures is essential, but can be challenging. The positive predictive value of physical examination findings has been reported to range from13-69%. In the setting of high clinical suspicion, the negative predictive value of a radiograph is 50-87%. Delayed detection is one of the factors contributing to nonunion and wrist dysfunction. The literature describes a false negative rate of up to 44% for detecting scaphoid fractures on conventional radiographs. CT, MR and ultrasound have each been advocated to detect clinically suspected fractures not evident on conventional radiographs. Recently, MR has been shown to be a sensitive, specific, accurate and cost effective screening tool in cases with a high suspicion but negative radiograph. Avascular necrosis of the proximal fragment is a well known sequela of scaphoid fractures. The incidence is 10- 15% for all scaphoid fractures and 30% after waist fractures. This unfortunate complication results from the fact that the majority of the blood supply to the scaphoid enters through the distal portion of the bone. The most common type of fracture, a transverse or oblique waist fracture, can disrupt the blood supply to the proximal fragment. On radiographs and CT, AVN is indicated by increased density of the bone. 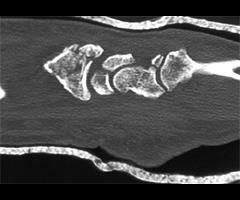 A study by Downing compared conventional radiographs 8 weeks following the fracture and high resolution helical CT at 12 weeks. Correlation was made with bone enhancement at gadolinium enhanced MR and rate of union at follow up. The results showed no significant association between "definitely increased density" on radiographs and diminished blood flow at MR. Radiographs are limited in specificity, as increased density can result from proximal pole rotation and new bone deposition. 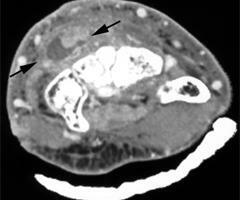 A correlation was found between "definitely increased density" at CT and decreased gadolinium enhancement. However, neither CT nor radiograph findings suggesting AVN were associated with the rate of fracture nonunion. 7. Which of the following is true with respect to the imaging findings on this CT of the scaphoid? A. A fracture line and a small round lucency are seen. An additional radiographic finding which would prompt further evaluation with CT in the setting of a clinically suspected scaphoid fracture is the presence of scaphoid lucencies. In a small percentage of scaphoid fractures (.3%), lucencies within the scaphoid bone were detected with no fracture line apparent on the radiograph. On CT, a fracture line was evident. These pseudocysts are hypothesized to arise secondary to ischemia, and indicate nonunion of scaphoid microfractures. 8. 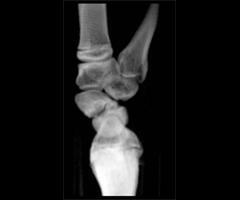 Which of the following is true with respect to malunion of this type of fracture? Correct! Incorrect. 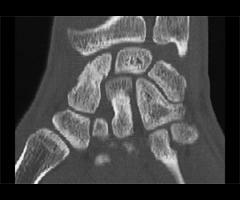 The correct answer is C.
Scaphoid malunion can manifest as a "dorsal humpback deformity". This finding is not always apparent on conventional radiographs due to obscuration by overlying bones. Owing to palmar angulation of the distal fracture fragment, the dorsal surface of the bone develops a bony prominence. Complications of this deformity include radiocarpal osteoarthritis and functional impairment. Fractures of the hamate most commonly involve the hamate hook. This type of injury is usually the sequela of direct trauma by swinging the handle of a baseball bat, golf club or tennis racquet, but can infrequently result from trauma directed to the proximal palm. 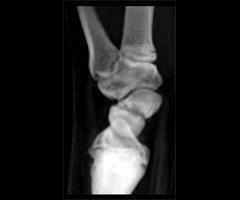 Traditional radiographic views of the wrist are usually insufficient to identify this fracture. Carpal tunnel radiographs or supinated oblique views of the wrist are required; however, even these views may not demonstrate the fracture, necessitating CT. CT in the axial plane is best for evaluation of the hamate hook. Sagittal displays are better for the body of the hamate. Diagnosis is important because the ulnar nerve travels near the hamate hook, and neurologic damage can result from the motion of an ununited fracture. 10. Which of the following is true with respect to the category of pathology demonstrated by these 2 cases? The hand and wrist may become infected by a variety of causes. Infection frequently follows trauma and can result from bite wounds and other penetrating trauma such as venipuncture and toothpick injuries. Those at risk for hand infection include intravenous drug abusers injecting in the hand with contaminated needles, and diabetics have been shown to have delayed resolution of upper extremity infections. Management of hand infection requires a thorough understanding of the difficulties that result from the virulence of the infecting organisms, the pathways of infection spread and the anatomy of the hand. Radiology is essential to delineate the course of infection spread and the anatomy involved, to properly guide medical and surgical management. Superficial infection may be limited to cellulitis; however, the role of imaging is to exclude abscess formation as well as involvement of tendons, deep fascia, bone or joint.